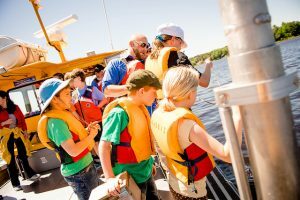 Young scientists sample the freshwater food chain through GM’s Ride the Waves at Michigan Tech’s Great Lakes Research Center. 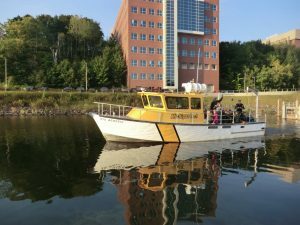 Whitefish bellies, lard-filled olives—and a boat ride on Michigan Tech’s 36-foot Research Vessel Agassiz. Just the thing to hook elementary students on science, technology, engineering and math. Funded by General Motors (GM) since 2013, Ride the Waves gets about 700 students per year out on local waters and into GLRC labs to work side-by-side with Michigan Tech students, staff and faculty. The goal: to better understand the freshwater environment and factors that affect it, from phytoplankton to mining waste. Middle school students from Baraga and L’Anse will be attending an Engineering Exploration summer camp at Michigan Tech this week. 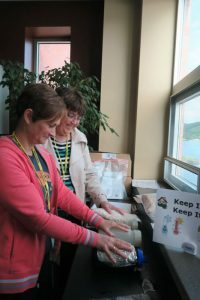 It is the second of three week-long science camps requested by the Keweenaw Bay Ojibwa Community College STEM Outreach Department and funded by a 4-year US Department of Education STEM education grant. Engineering Exploration will cover “What is Engineering,” chemical engineering, biomedical engineering, civil engineering and bridge building, transportation engineering, environmental engineering and materials engineering. It will run from 10 am to 3:30 p.m. Monday through Friday at the Great Lakes Research Center Room 104. A summer camp called Mathematica and Computer Applications will be held July 10-14 in the Forestry computer lab. Students will learn about geographic information systems (GIS), data collection and processing, base maps, importing and adding data from the world, making and editing a web map, mathematics and the Wolfram language, defining functions, Raspberry Pi, basic circuits and using sensors. The camp will wind up with a Quiz Bowl. For more information, contact Joan Chadde, jchadde@mtu.edu. Bethany Klemetsrud teaches summer camp students. In partnership with Michigan Tech, the Keweenaw Bay Ojibwa Community College STEM Outreach Department is going above and beyond for your typical summer camp. Today is part of a three week-long series of summer camps requested by the KBOCC. STEM, which stands for Science, Technology, Engineering and Mathematics, encourages students to be exposed to those respective fields at an early age. Read more and watch the video at UP Matters, by Calvin Lewis. HOUGHTON — Some middle school students from Baraga and L’Anse spent the week at Michigan Technological University learning everything from the logistics of running railroads to how to handle a remotely operated vehicle. Read more at the Daily Mining Gazette, by Garrett Neese. 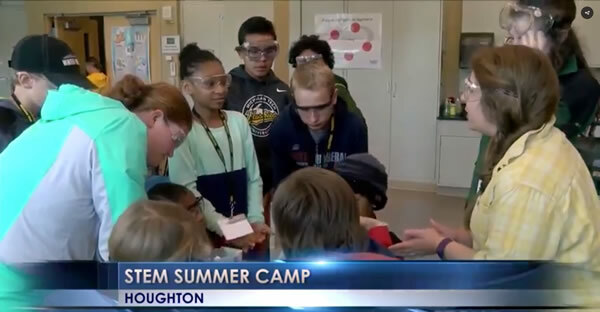 Michigan Technological University is reaching out again to keep local elementary and middle school students engaged this summer. Today’s first and second grade class focused on Making, Tinkering and Inventing. Read more and watch the video at TV6 Fox UP. Explore Natural Resources & Engineering at Michigan Technological University (Michigan Tech) in the Upper Peninsula of Michigan!! OPEN to all High School students in Genesee County who want to explore engineering forestry, water quality, fisheries, more! **Up to 15 high school students from Genesee County will be selected to participate. Talk to your teacher! In the forest, investigate invasive species, ID trees, collect amphibian data. Learn about engineering and natural resources majors and careers. Experience national and state parks, wildlife refuges, and nature sanctuaries with experts at Michigan Technological University and in Michigan’s Upper Peninsula!! Deadline extended to Friday, June 9! A team of educators, university staff, and resource specialists will select participants in mid-May. A mandatory Parent Meeting will be held in mid- June. Coordinated by Michigan Tech Center for Science and Environmental Outreach with generous funding from GM and the Ride the Waves Program at Michigan Tech’s Great Lakes Research Center. Additional funding from Michigan Tech School of Forest Resources and Environmental Science, College of Engineering, Departments of Civil and Environmental Engineering, Michigan Tech Transportation Institute, Admissions, Great Lakes Research Center. for Students in Grades 4-12 ~ Fun! FREE! Educational! 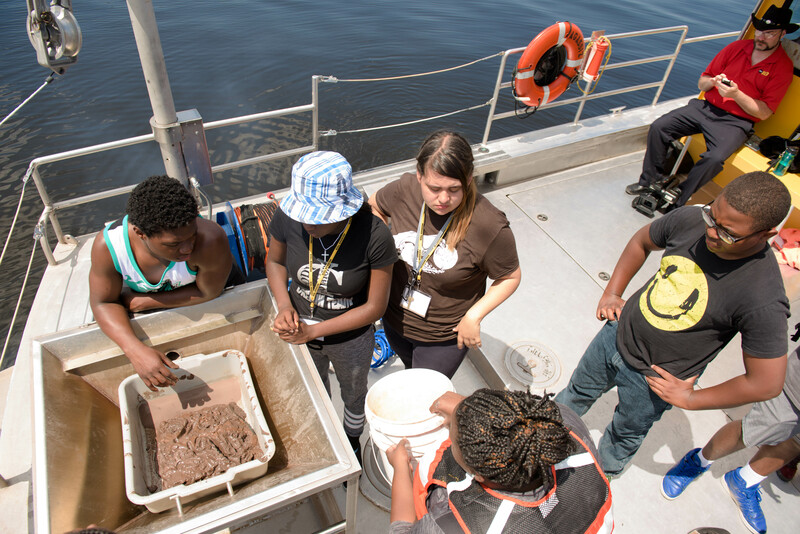 Michigan Tech’s Ride the Waves Program 2017 invites Copper Country youth in Grades 4-12 to join scientists from Michigan Tech’s Great Lakes Research Center in the exploration of Lake Superior, Portage Waterway and Torch Lake. There are four programs to choose from that will accommodate 18 youth and chaperones. Aquatic Food Web & Lab Investigation (3-hour session, 1.5 hrs on Agassiz &1.5 hrs in lab at the Great Lakes Research Center). Find out how scientists investigate water quality and collect samples to examine in the lab. Find out “what makes a lake trout?” All ages students. Mine Waste Remediation & Torch Lake Restoration (4-hour session, 2 hrs on Agassiz & 2 hrs on land; meet at the Lake Linden marina). The copper mining and milling history of the Copper Country is explored by land and water. Students visit historic copper milling sites, reclaimed mine waste sites, and the bottom of Torch Lake. Ideal for Grades 6-8 students. Navigation Exploration (4-hour session, 2 hrs on Agassiz & 2 hrs in classroom at the Great Lakes Research Center) Students use chart dividers and compasses to determine the Agassiz’s position on a navigational chart and then navigate the Agassiz to a new location. Students will use algebra to determine the accuracy of their navigation. Ideal for Grades 8-12 students. Lake Superior’s Ring of Fire (4-hour session on Agassiz) Explore an area in Lake Superior where the shrimplike organism Diporeia is up to 20 times more abundant than in any other part of Lake Superior! How does this affect the Lake Superior food web? Ideal for Grades 9-12 students. List all dates and times that work for your group and we will reply and fit you into the earliest available slot. Groups of 5 or more students will be given preference in scheduling, so get with your friends and form a group! Available May 25-Aug. 30, 2017. The Ride the Waves Program is made possible with a generous grant from General Motors (GM) and Michigan Tech’s Great Lakes Research Center. More than 3000 youth have benefited from GM’s support, now in its 5th year. Michigan Tech Center for Science & Environmental Outreach at the Great Lakes Research Center. CALUMET, Mich. (WLUC) — Some fourth grade students at CLK Elementary said the day’s lesson stunk. But that didn’t stop them from digging through trash to learn about waste management on May 9. Some fourth grade students at CLK Elementary said the day’s lesson stunk. But that didn’t stop them from digging through trash to learn about waste management on May 9. Read more and watch the video at TV6 Fox UP, by Harri Leigh. Investigate product life cycle, building design, renewable energy sources, low impact site design, water reuse, smart transportation and food systems with cutting edge research scientists and engineers at Michigan Technological University and community/teacher experts. 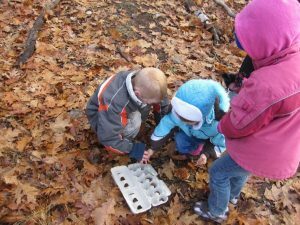 Teachers will engage in hands-on engineering lessons, gather resources for teaching about sustainability while addressing the new Michigan Science Standards. As well as learn how to share STEM sustainability career options with their students, all while spending an exciting week in the Keweenaw Peninsula enjoying the Great Outdoors! Participants will earn 30 SCECHs (pending) from Michigan Technological University for the 5‐day course. Complete pre‐course readings and reflections. Teachers who develop an approved lesson plan after the institute can earn $100. Due Sept. 5, 2017. Instructors include Michigan Tech faculty, community and teacher experts. $300 off campus includes 5 lunches, field trips, and classroom supplies, or $650 on campus which includes five nights lodging and meals. Teachers can choose to enroll in the course (ED5640) for 2 graduate credits. (There is an additional cost of $561 Official Applied Science Education Graduate Resident and Non‐Resident $561 per credit). Additional coursework required. Payment due June 15, 2017. Pay by credit card by calling MTU Cashier at 906.487.2247. Payments are non‐refundable. 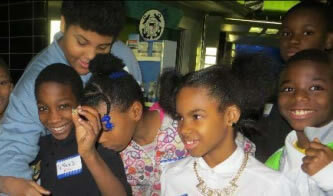 Teachers may apply for Michigan Space Grant Consortium K‐12 Educator Incentive Program funds for up to $400 to attend workshops on math and science. The class meets in the Great Lakes Research Center, a state‐of‐the art facility with many sustainability features. Participants staying on campus will receive 5 nights lodging in single rooms with private baths in Michigan Tech’s new Hillside Place and all meals from Monday breakfast through Friday lunch. Easy walking distance to downtown Houghton and Michigan Tech hiking and biking trails. Nearby camping and Super 8 Hotel options are available. 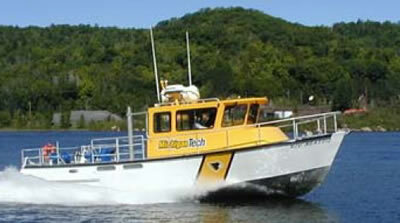 Michigan Technological University is in Houghton, MI (pop. 7,000). United Airlines is the sole airline serving Houghton (800‐241‐6522 or www.united.com) with two flights daily from Chicago. Taxi service is available by calling Copper Country Limo & Taxi at 906‐370‐4761. Why Come to Michigan Tech? It’s summer, right!? What better place to earn credit/SCECHs? After class, you can choose from hiking, biking, kayaking, Lake Superior beaches, beautiful sunsets at Mclains St. Park (10 miles away) or visit the more than 25 nature sanctuaries and preserves in the Keweenaw Peninsula. 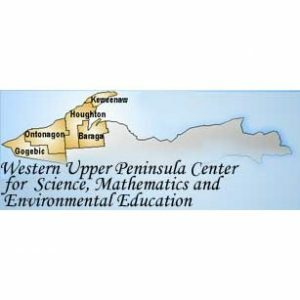 Supported by the Sustainable Futures Institute, Michigan Tech Transportation Institute, Great Lakes Research Center, and the Western UP Center for Science, Math and Environmental Education. Coordinated by the Michigan Tech Center for Science and Environmental Outreach.